Doc’s patients also provided or donated much of our machinery. As of this writing, the majority of the machines in our shop are older than the late 1960’s. A lot of our machinery was purchased with the help of Charles ‘Mac’ McKee. 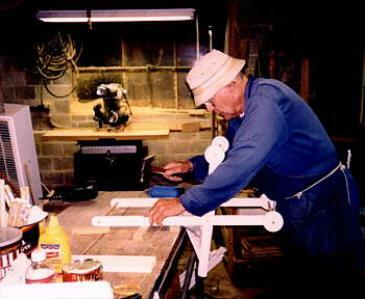 Mac was a machinery salesman in Dallas for over forty years. He would negotiate with his company for the wholesale, or better price for a piece of equipment that the shop needed. Then sell it to the shop, charging no commission on the sale. Doc would then try to find someone to help pay for it. Speaking of Mac, we lost him in 1999. He was the most faithful ‘Toy Maker’ ever, next to Doc himself. 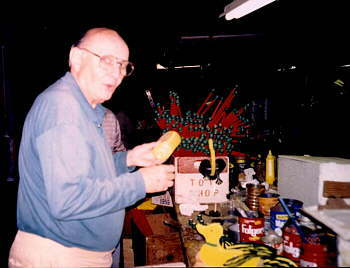 Mac worked for more than 35 years at the Toy Shop. Mac could repair anything, and make a machine do anything you’d need. Boy he could make those machines sing! Mac was always busy keeping the equipment properly serviced. He also designed the Baby Carriage that we make today. If you asked him how he got into the Hobby Crafters, Mac would say ‘I came to the shop one night along with some of my fellow workers, just for a single evening of volunteer work. Then I could just never stop coming back’. Mac was at the shop early every Thursday night, up until the last 4-6 weeks of his life. He had become so ill that he could not leave his home. At that point, we had to go by his home every Friday evening to give him a report of how things were going at the shop. Prior to his illness, Mac never missed coming to the Toy Shop more than once a year. Getting back to the man who started it all, Dr. McNeill….About 1989 Doc’s health was failing rapidly. He had several heart attacks, a second stroke, and was almost bed ridden. He held a meeting of the Toy Shop workers and said, ‘I need to go into a Nursing Home so that I will not be a burden on my wife. We need someone who will take the responsibility of opening the shop every Thursday evening, and closing it every Thursday night. This person will also have to take care of getting supplies and making sure everything is working toward our Christmas goal. Otherwise the shop must close down.’ There were ten of us present, and everyone offered to help whoever would accept the job, but no one would accept the position. So Jerry Reichert took it. This story is about Mr. & Mrs. Santa Claus, who started a group called 'Hobby Crafters' -- The Hobby Crafters Foundation Toy Shop produces hand made wooden toys at no charge for needy children. These toys are distributed by Dallas area churches and missions at Christmas time. Hobby Crafters had it’s beginning about December of 1944. It was started by Dr. Arch Mc Neill, at the time he was a young Dallas physician. He was making a medical house call, (back when they did this type of thing). The lady he was called to care for was named Mrs. Birchfield. She was a kindly lady that had no children of her own. But what she did have was a heart of gold, especially when it came to poor children. Mrs. Birchfield worked in the old Medical Arts Bldg., in downtown Dallas. She operated a pushcart in the building. She sold cigars, cigarettes, candy, gum, shoelaces, etc. Dr. McNeill was one of her regular customers. Mrs. Birchfiled lived in the Trinity River Bottoms between Dallas and Irving, Texas. This was long before the Trinity Industrial District, Stemmons Freeway, Irving Blvd., or anything like that was ever dreamed of. She lived on one of the roads that led to Cement City and Old West Dallas. At that time, these areas were the poorest sections of Dallas. In the winter, Mrs. Birchfield always had a pot of beans on the stove for those traveling or in need. She also started a tradition of having a Christmas tree in her home, under which she would have small gifts, sweets, and other such goodies for the children of the area. While Dr. McNeill was attending to her, she told him about her Christmas tree effort, and how she wished the she could supply more for the poor children that came to her door. Dr. McNeill was very moved by her story, and he made a cash donation. He also offered to make a few toys in his home workshop, to be given to the children the following Christmas. That next year he made almost one hundred toys….and so the Hobby Crafters began. Some of the toys made by the Hobby CraftersDoc McNeill and Friends Doc then began to enlist the help of friends and associates, and the number of toys that were produced increased rapidly. The group originally called themselves “The Saints and Sinners”. Doc also began to enlist the aid of his patients. As he told me, he would simply suggest to a patient ‘you need to breathe a bit of saw dust’. He would then give them a piece of paper with the shop address on it and say, ‘come to this address next Tuesday evening at 6 p.m. for all the saw dust that you’ll need….and there’s no charge for this office visit’. (At that time the shop met on Tuesday instead of Thursday) So, now he had a worker. At this point I would like to take a moment to speak some about Doc’s wife, Francis. First of all, Francis is not really her name. Her real name is Ila Faye McNeill. Doc nicknamed her‘Francis’ after a popular 1950’s Television show that featured a talking mule named Francis. The name stuck, and everyone knows her as ‘Francis’. When Doc went into the nursing home, Francis was more dedicated than anyone I have ever known. Francis would make him breakfast every morning, and then take it to him at the nursing home. As he got worse, she would feed him. She would then stay with him until they brought the noon meal, and feed him lunch. Francis would then go home, take a short nap, and return to feed Doc his evening meal. She did this seven days a week for several years until her health began to fail. At that time, Francis herself went into a nursing home. We lost Doc in 1998. Francis couldn’t attend the services because of her health. Doll Strollers are always a favorite with the little girls! There have been many things that have happened at the Toy Shop that are hard to understand. I personally come form a fairly religious family. Having gotten my first ten years of education in parochial schools with daily church attendance, I thought I had seen it all. But the Toy Shop has brought me more belief in God and a supreme being than all the religion classes I ever attended. It is as if someone is looking after the shop. I would like to recount here just three of the things that have happened at the shop over the years to cause me to feel this way. First, I would like to mention that a number of years ago the area in which we were located began to be very crime ridden. On summer nights we would often hear gunfire coming from the large low-income apartment complex across the street. Doc said, ‘We need some lights around the shop, several of our workers have expressed a fear of being accosted going to and from their vehicles.’ So we had several electrical contractors come out and discuss the cost of installing what we felt was the minimum required lighting. The best quote we could get at that time was $800.00. There was no way that we could afford $800.00! After a lot of inquiring, we came across an electrical company executive that agreed to come out and look at the shop. After visiting with us, he said ‘Let me work on this’. One afternoon a little later, he called and said ‘There is someone that I want you to show the shop to’. We met with them the next afternoon. As it turned out, the second man was worked for an electrical fixture manufacturer who donated the fixtures. The first man’s company donated the labor, and we now have lights for our workers. Our buildings were in very poor conditions, from old age. The newest one is of haydite block construction and was built in the 1960’s. In this building we have a wood-burning stove. We joke about it being our central heat and air conditioning unit. However, we were getting by with fans in the hot summer time. Anyway, a few years ago we had a very bad rainwater leak in two of our buildings. These are old flat roofs, which are expensive to repair. The leaks were so bad that we had to leave a lot of plastic trashcans at strategic locations around the shop in case it rained during the week. Otherwise we could not run the electric equipment on shop night. Standing on wet cement and running high voltage equipment is quite dangerous! We did this trashcan thing for about a year or two, and had gotten three estimates to repair the roof. Two of them were pretty close, but they were estimated at twenty thousand five hundred dollars and twenty two thousand dollars! A third quote was given to us by a roofing company owner, who said he knew of us and would do us a quality job at cost. But we would still have to come up with a little over $14,000.00! There was no way with a budget at the time of about $5,000.00 per year that we could possibly afford this kind of expense. So we did without the roof repair. One day, out of the blue, I got a call from a man who asked ‘Are you associated with the Toy Shop?’ Of course I answered yes. He said ‘I understand that you have a leaking roof problem.’ I said, ‘Yes sir, we have a terrible problem.’ He went on to ask if we had a repair estimate done. After discussing the roof, I gave him the estimate prices that we had been given. We talked a bit more, and then he said, ‘You will receive a check’ and then he hung up abruptly. Shortly thereafter, we received a cashier’s check for $14,000.00, made out to the roofing company whose name I had given him. The roofs were repaired with us not knowing who our benefactor was. I later got a call from the same man. He asked, ‘Did you receive the check?’ I said yes. ‘Did you get the roofs repaired?’ Once again I said yes. I then went on to ask him, ’Sir, we want to Thank you very, very much. May I send you a thank you note? We are recognized by the Internal Revenue Service as a charitable institution, and they will allow you to deduct this wonderful contribution from your income taxes.’ He said, ‘No, just keep making toys.’ Then he hung up the phone. We have no idea who he was, where he came from, or where he heard about our needs, but Thank God for him. Last but not least, a few years ago our air compressors (two 220 volt units) and all of our electricity in one building had quit working. Mac had found that they were wired thru the wall and under ground, then around to one of the other buildings. At the other building we had current going into the ground, but none coming out at the building where the compressors were located. After much checking, we found the problem. A company that specializes in finding underground short circuits came (at no charge) and showed us where the problem was located. Thirty or forty years ago, a pillar that supports one of the additions to our building had been set directly over this electrical cable. Over the years it had settled down enough to break the cable. We dug up the area and found the break. Mac gave me a sample of the cable, telling me to get five or six feet of it so that we could make the repair. After a lot of searching, I found that this cable could not be bought, except commercially. It was too heavy and was not available on the general market. The only people that used wire of that size was Dallas Power & Light Co. I went to them. They would not sell it at any cost! A few days later we noticed a Dallas Power & Light Co. crew working on high voltage lines near the shop. It was about lunchtime, so we looked up the foreman. We offered to buy the foreman a good lunch if he would let us run him by the Toy Shop to see what we do there. He was agreeable. After looking at the problem, and seeing the toys that we make. He looked at the chain link fence and said, ‘ Is that gate always locked? Because if it were left unlocked the rest of the day, you never can tell what might happen.’ I left it unlocked. About six o’clock that evening I went by the shop to lock the gate. The hole were the shorted wire had been located was filled in, and the electricity was working in the building that previously had no power. In the spring of 2014 the Toy Factory needed to find a new home, and through the network of volunteers we were contacted by the family of Paul Mason, a former elf before his health caught up to him. They asked what they could do to assist. I said we need a small building that was safe and had a working bathroom. Working with Steven Dunker, the grandson, we were able to not only meet those needs but find a building down the street from the Garland Police department that was twice the size of the existing buildings. It didn't stop there, Paul Mason was known for saying "If something is worth doing, it is worth doing right". Throughout the process Steven would repeat that saying when deciding to upgrade the building to exceed our expectations. In addition, his family's foundation have agreed to provide the building and utilities. Moving to the building has been a blessing and has allowed us to have two shifts of volunteers, which we believe could more than double the toys we provide to needy children in the future. What I have told you here are just a few of the many things that keep the shop going. I believe with all of my heart that it is such a good project that it will continue long after I am gone. Doc used to tell me ‘when it’s my time, someone will come to take my place’ I always told him, ‘Doc, that’s great, but it’s not me. I’m a traveling salesman with five children, operating a small farm, keeping up several rent houses. I’m just to busy to take on that job.’ Doc would just smile and walk away. I truly believe that the ‘Toy Shop’ is to good a project to die. No matter what, the good Lord looks after it, and whether it is me, or whoever else is left in charge, IT WILL KEEP ON GOING!